In addition, the agencies seek examples of jurisdictional determinations that would improve clarity and consistency in regulations. Groups in favor of the revised “waters of the United States” (WOTUS) definition believe it sufficiently protects water resources and is more consistent with the statutory and legislative history of the Clean Water Act prior to the 2015 Clean Water Rule. Groups against the revised WOTUS definition believe it does not sufficiently protect our water resources, ignores science-based information regarding connectivity of surface waters, and weakens regulatory authority under Clean Water Act. The definition of “waters of the United States” (WOTUS) is significant because waters included under the definition are protected by the Clean Water Act. The definition has potential implications for drinking water, public health, fisheries, and wildlife habitat. This definition has changed several times since the Clean Water Act was established (see timeline below). As of February 2018, the 2015 Rule has been implemented in 22 states and blocked in 28 states through district court rulings. The current proposed rule is the second part of the EPA’s two-step plan implemented in response to the 2017 Executive Order. Step One of the EPA’s plan, termed “Repeal,” culminated in a 2018 rule which stated that the 2015 WOTUS definition would not be applicable until February 6, 2020. This delay was established to give ‘the agencies the time needed to reconsider the definition of “waters of the United States.”’ The second step of the process, termed “Revise,” will re-define WOTUS in order to clarify “the federal authority under the Clean Water Act” (EPA, WOTUS Rulemaking Webpage). Evolution of the current definition of "waters of the United States"
For an extended description of key court cases and rulemakings leading up to the 2015 “Waters of the United States” Rule, see our Step One: Repeal summary. Context: (1) Definition of "waters of the United States" and the Clean Water Act, (2) Evolution of the current definition through relevant court cases, (3) The Clean Water Rule. In 2015, the Environmental Protection Agency and the Department of the Army published the Clean Water Rule: Definition of `Waters of the United States'. The agencies now propose to replace the 2015 definition of “waters of the United States”, and reinstate the definition of "waters of the United States" 'that existed prior to the 2015 rule, to reflect the current legal regime under which the agencies are operating.' This is in compliance with the February 28, 2017 Executive Order “Restoring the Rule of Law, Federalism, and Economic Growth by Reviewing the `Waters of the United States' Rule.”Changing the definition of "waters of the United States" changes the waters which fall under the provisions of the Clean Water Act. 'In this proposed rule, the agencies would rescind the 2015 Clean Water Rule,' and replace it with the definition of "waters of the United States" used prior to the Clean Water Rule. This is the definition currently being implemented by the EPA and the Army Corps of Engineers. The legal definition for “waters of the United States” greatly impacts how the Environmental Protection Agency (EPA) implements the Clean Water Act. The Clean Water Act, or CWA, was established to prevent, reduce, and eliminate pollution in the nation’s water in order to “restore and maintain the chemical, physical, and biological integrity of the Nation’s waters” and to eliminate discharge of pollutants in “navigable waters” (section 101(a); section 502(7)). Additionally, the CWA establishes permit systems, programs, and standards, to meet its defined goals, among which includes the dredge or fill discharge permit program (section 404(a)). This program prohibits any discharge of dredged or fill materials into “navigable waters”, defined as “waters of the United States”, unless authorized by a permit issued by the Army Corps of Engineers. How "waters of the United States" is defined directly effects "the scope of CWA jurisdiction, [which] is an issue of great national importance." This definition has changed several times since the CWA was established. The US Army Corps of Engineers issued a regulation to interpret the dredge or fill discharge permit program of the CWA to include “adjacent wetlands” as waters of the United States, and defined “adjacent wetlands” as “those areas that are inundated or saturated by surface or groundwater at a frequency and duration sufficient to support, and that under normal circumstances do support a prevalence of vegetation typically adapted for life in saturated soil conditions”. This expansion of the “waters of the United States” was upheld by the Supreme Court in a 1985 court case. Bayview Homes, Inc. began placing fill materials on its property near Lake St. Clair, Michigan and the Corps issued a suit to prevent Bayview Homes from filling its property without applying for the required permit. Ultimately, the Supreme Court deferred to the Corps’ judgment that adjacent wetlands are “inseparably bound up” with waters to which they are adjacent, and upheld the inclusion of adjacent wetlands in the regulatory definition of “waters of the United States”. In 1986, the Army Corps of Engineers attempted to clarify its jurisdiction stating that the definition of “waters of the United States” extends to intrastate waters that provide habitat for migratory birds, as migratory birds are a form of interstate commerce. This was dubbed the “Migratory Bird Rule” (FRL-7439-9). Ultimately, the Supreme Court ruled the use of ‘isolated’ non-navigable intra-state ponds by migratory birds was an insufficient basis for federal regulation. This decision did not call into question previous rulings for wetlands ‘adjacent’ to navigable waterways, but did introduced a concept that it is a ‘significant nexus’ which informs the Courts reading of the CWA jurisdiction over non-navigable waters. This ruling came from a court case following the Solid Waste Agency of Northern Cook County selection of an abandoned sand and gravel pit as a solid waste disposal site. This pit, after being unused for a long period, had evolved into permanent and seasonal ponds. The operation required some of the ponds to be filled, which required a landfill permit from the Army Corps of Engineers. The Corps refused to issue the permit on the basis of the Migratory Bird Rule. Even though lower courts had sustained the Rule for the 15 years since the Rule was implemented, this case went to the Supreme Court, which threw out the Rule. In 1989 the petitioner, John A. Rapanos, backfilled wetlands on a parcel of land he owned and sought to develop in Michigan. The parcel included land with sometimes-saturated conditions, though the nearest navigable water body was 11 to 20 miles away. Rapanos was informed his land included ‘waters of the United States’ even though they were not navigable waterways. It was determined that a critical factor in the CWA’s coverage is whether the water has ‘significant nexus’ to downstream ‘traditional navigable waters’ – in other words, is the water important to protecting the chemical, physical, or biological integrity of navigable waters? A guidance was issued in 2008 by the EPA and Corps for clarification, but the agencies did not officially change or codify the definition. The EPA and the Corps were ask to replace the 2008 guidance (above) with a regulation to provide more clarity by a range of organizations, including Congress, developers, farmers, state and local governments, environmental organizations, and energy companies. The agencies published a final rule defining the scope of the “waters of the United States” protected under the CWA: the 2015 Clean Water Rule: Definition of “Waters of the United States”. The definition established in this rule incorporated the Supreme Court Decisions of Riverside, SWANCC, and Rapanos, in addition to agencies’ experience, expertise, scientific review, and public comment periods. The 2015 Clean Water Rule established eight types of waterways and the extent of the legal power to regulate those waters under the CWA. This rule also established a "significant nexus" standard which allows agencies to interpret the scope of the “waters of the United States” if the waters in question significantly affect the chemical, physical, or biological integrity of traditional navigable waters, interstates waters, or territorial seas - either alone, or in combination with similarly situated waters in the region. So any of the excluded waters above are subject to a case-specific analysis to determine if a "significant nexus" exists, and if it does, that specific water body is regulated under the Clean Water Rule. After publication of the final Clean Water Rule, thirteen States and additional parties sought judicial review about the Rule’s scope and legal authority. In State of North Dakota et al. v. US EPA the Sixth Circuit court of appeals paused the implementation of the Clean Water Rule until the Supreme Court could hear the case and make a decision on its legality. As of August 2017, the EPA and the Corps use the pre-Clean Water Rule definition of “waters of the United States” to implement the Clean Water Act. An executive order was issued on February 28, 2017 (Presidential Executive Order on Restoring the Rule of Law, Federalism, and Economic Growth by Reviewing the “Waters of the United States” Rule) which called for a review of the 2015 Clean Water Rule by the Administrator of the EPA and Assistant Secretary of the Army for Civil Works to ensure “the Nation’s navigable waters are kept free from pollution, while at the same time promoting economic growth, minimizing regulatory uncertainty, and showing due regard for the roles of Congress” and to rescind or revise any rules, orders, regulations, guidelines, or policies that do not comply with these goals. Additionally, it states the definition of “navigable waters” will be interpreted as defined by 33 U.S.C. 1362(7) “in a manner consistent with Justice Antonin Scalia in Rapanos v. United States, 547 U.S. 715 (2006),” who expressed concern over the Corps' broadening of the definition of "waters of the United States" as regulatory overreach. Context: (I) Bristol Bay Watershed and the Pebble Deposit, (II) 2014 Proposed Determination and Section 404(c) of the Clean Water Act, (III) Lawsuit and Settlement. ‘The proposal reflects the Administrator's decision to provide the Pebble Limited Partnership with additional time to submit a permit application to the Army Corps and potentially allow the Army Corps permitting process to initiate without having an open and unresolved section 404(c) review.’ The Pebble Limited Partnership needs a permit from the Army Corps of engineers to discharge dredged or fill material into US waters. Although the Pebble Limited Partnership can submit a permit application to the Army Corps while a section 404(c) review is open, the Army Corps cannot issue a final decision on the permit. The 2014 Proposed Determination was one step in an open 404(c) review process. If a final withdrawal decision is made following this comment period, whether the Administrator should review and reconsider the withdrawal decision. For more detailed timeline, refer to this graphic by the Bristol Bay Native Corporation. Bristol Bay is where the Bering Sea meets the expansive floodplain of Southwest Alaska. The complex hydrography of the region, with its numerous rivers, streams, and lakes, provides healthy habitat for wildlife such as salmon, bears, moose, and waterfowl. Every year, up to 40 million sockeye salmon return to this watershed to reproduce, and their migration supports the livelihoods of human communities in Alaska. The Yupik, Alutiiq, and Dena’ina peoples have called Bristol Bay home since time immemorial; for these groups, subsistence fishing, hunting, and gathering are important livelihood and cultural activities. The contributions of the Bristol Bay fishery to the vibrancy of Southwest Alaska was formally recognized in 1972, when Senator Jay Hammond and the Alaska Legislature established the Bristol Bay Fisheries Reserve, in order to protect the area from the potentially harmful effects of oil and gas development. In addition to its ecological and cultural wealth, Bristol Bay also contains substantial mineral deposits; the Pebble deposit is among them. Approximately 90 million years ago (around the time T. rex was alive! ), as the Pacific tectonic plate slid beneath the North American plate, magma containing dissolved copper, gold, molybdenum, and silver, deposited these metals into the Pebble region. In the late 1980’s, the mining company Teck conducted explorations in the area and discovered these mineral deposits. The deposits are very large but they are considered “low-grade”, meaning that the desired copper, gold, and molybdenum minerals are “sprinkled throughout the rock like fine grains of sand” ("The Deposit," Pebble Partnership). At present, the land on which the Pebble Deposit is located is owned by the State of Alaska. However, all mineral rights to the Pebble deposit are held by Northern Dynasty Minerals Ltd, a mining company based in Vancouver, British Columbia. Northern Dynasty’s principal asset is the Pebble Mine Project ("Company Overview," Northern Dynasty Minerals Ltd.). The EPA determined that the sum of these impacts could result in “unacceptable adverse effects on fishery areas (including spawning and breeding areas),” and it was not “demonstrated to the satisfaction of EPA Region 10 that no unacceptable adverse effect(s) will occur.” Section 404(c) of the Clean Water Act authorizes the EPA to “prohibit, restrict, or deny the use of any defined area in waters of the United States for specification as a disposal site” when “unacceptable adverse effects” are expected on municipal water supplies, shellfish beds and fishery areas (including spawning and breeding areas), wildlife, or recreational areas. While a section 404(c) review process is ongoing, the Army Corps of engineers can not issue a final decision on a permit to allow dredged or fill material to be discharged into US waters. A two-month public comment period was held from July 21-Sept 19 2014, and received over 670,000 written comments. Over 830 community members attended 7 hearings in southwest Alaska during the week of August 11, 2014, delivering over 300 oral statements. In response to the Proposed Determination, the Pebble Limited Partnership filed litigation against the EPA. The case challenged the EPA’s “interpretation that it has the statutory authority to conduct a review... in order to veto mining-related activities on State land currently open to mining, even though no permit applications for mine development have been filed” (Geraghty & Heese, Pebble Limited Partnership v. United States Environmental Protection Agency). On May 11, 2017 the EPA entered into a settlement agreement with Pebble Limited Partnership, which ended litigation. The settlement agreement allows Pebble Limited Partnership to apply for a Clean Water Act dredge and fill permit from U.S. Army Corps of Engineers before the EPA can specify restrictions to the discharge of dredged and fill material associated with mining. Specifically, the EPA must wait 48 months from the settlement date - or until the U.S. Army Corps of Engineers issues its final environmental impact statement -before it issues a determination. As a result, EPA has agreed to initiate withdrawing the current Proposed Determination within 60 days of the settlement. Other terms of the settlement include the Pebble Limited Partnership dismissing all lawsuits against the EPA, the Pebble Limited Partnership agreeing to withdraw and not file any more Freedom of Information Act requests or lawsuits regarding Bristol Bay for a specified period, and that the EPA may use the scientific Bristol Bay Watershed Assessment without any limitation. Within a few hours after the EPA announced its plans to withdraw its 2014 Proposed Determination, the National Resources Defense Council put out a statement that reflected the frustration not only of many environmental groups and NGOs, but also of Bristol Bay residents, Native Alaskan communities, and commercial fishermen: “First, the facts have not changed… Second, the science has not changed… Most important, the opposition has not changed.” So what are the facts, the science, and the opposition? To quote the EPA’s own publication of the 2014 Proposed Determination in the Federal Register, “After three years of study, two rounds of public comment, and independent, external peer review,” the EPA determined that “the extraction, storage, treatment, and transportation activities associated with” Pebble Mine operations “would pose significant risks to the unparalleled ecosystem that produces one of the greatest wild salmon fisheries left in the world. In simple terms, the infrastructure necessary to mine the Pebble deposit jeopardizes the long-term health and sustainability of the Bristol Bay ecosystem.” Even with under smallest-scale mining scenario, this includes total habitat losses of “more than 1,200 acres of wetlands, lakes and ponds,” the equivalent of “more than 350 football fields.” The size of the mining operations is expected to be so expansive because (1) low-grade mineral deposits like the Pebble deposit require the processing of large quantities of raw material, and (2) none of the necessary infrastructure currently exists to contain hazardous mining waste, such as a power plant, deep-water harbor, roads, pipelines, and multiple tailings dams. Under Section 404(c) of the Clean Water Act, the EPA is authorized to prohibit or otherwise restrict the use of a any waters as a disposal site after it determines that the discharge of dredged or fill material will have an “unacceptable adverse effect” on municipal water supplies, shellfish beds and fishery areas (including spawning and breeding areas), wildlife, or recreational areas. The EPA asserts that it has used this authority “judiciously and sparingly,” having completed only 13 Section 404(c) actions in the 42 years since the Clean Water Act was established. The most recent prior use of Section 404(c) actions was in 2011, to withdraw the use of certain streams and wetlands within West Virginia, "as a disposal site for dredged or fill material in connection with construction, operation, and reclamation" of a surface mining operation (Final Determination of the Assistant Administrator for Water Pursuant to Section 404(c) of the Clean Water Act Concerning the Spruce No. 1 Mine, Logan County, WV). 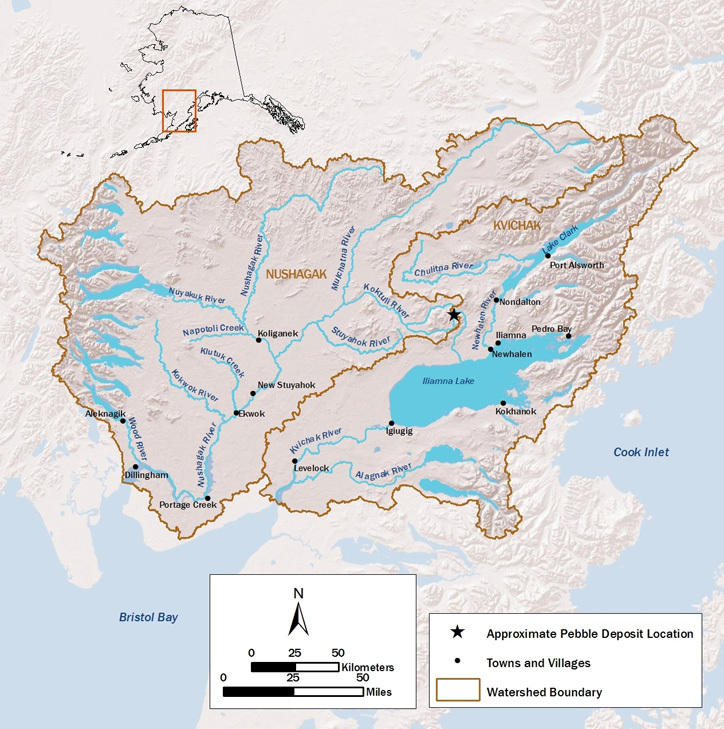 Renewed opposition to the project includes the Sustaining Bristol Bay Fisheries (SBBF) project, an initiative by the United Tribes of Bristol Bay to collaborate directly with the commercial fishing industry (Lill & Dillingham, Alaska Public Media), and a citizens initiative for the 2018 ballot that would add protections for salmon habitat in the face of big projects like the proposed Pebble mine (Herz, N. Alaska Dispatch News). The EPA’s issuance of a Proposed Determination in 2014 was described as “extraordinary conditions” by the Pebble Limited Partnership CEO because it could be described as outside of the “normal permitting and review process.” The EPA placed restrictions on mine development before a permit had been sought for the project; the Pebble Limited Partnership was not even given the opportunity “to present a detailed mine plan, file for permits, or initiate the state and federal permitting process” (“EPA Period for Public Comment Open Until Sept.19,” The Pebble Partnership). The Pebble Limited Partnership CEO also cited the importance of the mining project to the economic development of Alaskan communities, as “this project represents the potential for billions of dollars of investment, thousands of long-term, high-wage jobs and the potential for significant economic activity while at the same time providing revenue for local, state, and federal governments.” (“Pebble, EPA Reach Resolution in Long Standing Dispute,” The Pebble Partnership). These economic benefits were quantified in a study completed by IHS Global Insight, an economic analysis and forecasting firm, which used ongoing engineering plans to serve as a proxy for a definitive development plan. The the construction phase of the project (years 1-5) would generate 16,175 jobs annually and the initial production phase (years 5-29) would generate 15,000 jobs annually; although only 4,725 and 2,890 employment positions, respectively, would be held by Alaskans. The remaining ~11,000 positions would be created in the lower 48 states. The mine would also generate approximately $726.7 million to $1.7 billion in total annual revenue from copper production. This would increase total US copper production by 20% above the 2011 production level, contributing to the Trump administration’s goal of advancing national resource extraction in order to decrease United States’ reliance on foreign imports. PLP - Pebble Limited Partnership. The Pebble Limited Partnership’s subsidiaries own the mineral claims to the Pebble mineral deposit. The Partnership is owned by Northern Dynasty Minerals Limited. Section 404 permit - “Section 404 of the Clean Water Act establishes a program to regulate the discharge of dredged or fill material into the waters of the United States, including wetlands. Activities in waters of the United States regulated under this program include fill for development, water resource projects (such as dams and levees), infrastructure development (such as highways and airports) and mining projects. Section 404 requires a permit before dredged or fill material may be discharged into waters of the United States” ("Section 404 Permit Program," EPA). Environmental Protection Agency. (2011, Jan. 19). "Final Determination of the Assistant Administrator for Water Pursuant to Section 404(c) of the Clean Water Act Concerning the Spruce No. 1 Mine, Logan County, WV." Published in The Federal Register 76(12):3126-3128. Geraghty, M.C. & Heese, R.H. Motion to Intervene in Pebble Limited Partnership v. United States Environmental Protection Agency (District Court for the District of Alaska). Contributors: Assistant Professor, Aquatic Ecology; PhD Candidate, Aquatic & Fishery Sciences; PhD Student, Aquatic and Fishery Sciences; MS Student, Aquatic and Fishery Sciences. Title: Taking of marine mammals incidental to specified activities; taking marine mammals incidental to geophysical surveys in the Atlantic Ocean. In this context, “take” refers to the harassment of marine mammals. Under the Marine Mammal Protection Act, “harassment is defined as: “Any act of pursuit, torment, or annoyance which (i) has the potential to injure a marine mammal or marine mammal stock in the wild (Level A harassment); or (ii) has the potential to disturb a marine mammal or marine mammal stock in the wild by causing disruption of behavioral patterns, including, but not limited to, migration, breathing, nursing, breeding, feeding, or sheltering (Level B harassment).” NMFS can grant authorization for incidental take of marine mammals if they find that the taking 'will have a negligible impact on the species or stock(s), will not have an unmitigable adverse impact on the availability of the species or stock(s) for subsistence uses,' and if mitigation, monitoring and reporting of take meet requirements. The authorization process was initiated when NMFS received individual applications from four companies between August 18, 2014, and September 5, 2015. NMFS posted the applications for public review and sought public input in July of 2015. A fifth company applied after this comment period, so was published separately for public comment. In addition to authorization under the Marine Mammal Protection Act, the seismic survey proposals were subject to a required Programmatic Environmental Impact Statement by the Bureau of Ocean Energy Management, with participation by NMFS. Under the National Environmental Policy Act, programmatic environmental impact statements evaluate the effects of broad proposals or planning-level decisions. Finalization of the National Marine Fisheries’ Service proposal will issue incidental harassment authorizations for the take of marine mammals during seismic survey activities by five companies that 'provide services, such as geophysical data acquisition, to the oil and gas industry.' The proposed seismic surveys utilize air guns for hydrocarbon exploration 'within the US Exclusive Economic Zone from Delaware to approximately Cape Canaveral, Florida,' in the Bureau of Ocean Energy Management’s Mid-Atlantic and South Atlantic planning areas. The temporal extent of the survey activities vary by company, ranging from 155 days (CGG) to 208 days (Western) of seismic operations. During each day, operations would typically occur for the full 24 hours. Environmental groups (e.g. the NRDC, Oceana, National Geographic) along with many scientists have come out against these seismic surveys because of the potential impact on marine life. Several scientific groups have written to the presidential administration since this permitting process was initiated. In 2014, 75 marine scientists sent a letter to the Obama administration expressing concern of “significant, long-lasting, and widespread” harm to East Coast marine mammal and fish populations. According to these scientists, “The Interior Department’s decision to authorize seismic surveys along the Atlantic coast is based on the premise that these activities would have only a negligible impact on marine species and populations. Our expert assessment is that the Department’s premise is not supported by the best available science. On the contrary, the magnitude of the proposed seismic activity is likely to have significant, long-lasting, and widespread impacts on the reproduction and survival of fish and marine mammal populations in the region.” Another letter from a different group of scientists in 2016 specifically addressed concerns about the endangered North Atlantic right whale population in the region. While impacts on marine mammals tend to generate the most attention in the media, “seismic surveys have been shown to displace commercial species of fish, with the effect in some fisheries of dramatically depressing catch rates. Airguns can also cause mortality in fish eggs and larvae, induce hearing loss and physiological stress, interfere with adult breeding calls, and degrade anti-predator response: raising concerns about potentially massive impacts on fish populations. In some species of invertebrates, such as scallops, airgun shots and other low-frequency noises have been shown to interfere with larval or embryonic development.” To this end, various fishing groups and Fishery Management Councils (South, Mid-Atlantic and New England) have also expressed concern about the seismic surveys. According to a news release from Oceana, there are “125 East Coast municipalities, over 1,200 elected officials, numerous commercial and recreational fishing interests, and an alliance representing over 41,000 businesses and 500,000 fishing families that have publicly opposed offshore drilling and/or seismic air-gun blasting." On the other hand, the oil and gas industry are pushing for the surveys in order to map potential drilling sites. This would contribute to the fulfillment of President Trump’s April executive order aimed at expanding drilling in the Arctic and Atlantic Oceans. Exploratory seismic surveys are necessary for future drilling operations in this region because no surveys have been conducted in the area for at least 30 years. Oil and gas companies will use the information obtained by the seismic surveys “to make informed business decisions regarding oil and gas reserves, engineering decisions regarding the construction of renewable energy projects, and informed estimates regarding the composition and volume of marine mineral resources. This information would also be used to ensure the proper use and conservation of OCS energy resources and the receipt of fair market value for the leasing of public lands.” (Bureau of Ocean Energy Management). The motivation for the aforementioned executive order is to reduce the United States’ dependence on foreign oil imports. According to the US Energy Information Administration, while US net imports (net imports = imports – exports) of petroleum from foreign countries in 2015 were at the lowest level since the 1970s, net imports were still approximately 25% of US petroleum consumption. The Programmatic Environmental Impact Statement (PEIS) "considers potential impacts on 13 different types of resources (e.g., marine mammals, fish, benthic communities, and cultural resources), as well as cumulative effects from oil and gas exploration and other human activities in these areas. The PEIS also considers the potential effects from 11 different ‘impact producing factors’ on these resources. Of these factors, sound from geophysical survey sources presents the highest potential for impacts.” (Bureau of Ocean Energy Management). In response, the Bureau of Ocean Energy Management worked with NMFS and several other agencies to develop a comprehensive mitigation strategy that, according to their report, focuses on “(1) avoiding injury from exposure of air gun sound sources to marine animals in close proximity to the source; and (2) reducing the potential for behavioral disruption.” The preferred course of action identified in the PEIS includes “aggressive” mitigation measures. The industry groups themselves not only cite the extensive mitigation measures as reason to move forward, but also point out the fact that seismic surveys have been conducted in the US and around the world for decades with few negative impacts (per 2014 testimony by Dr. James Knapp for the U.S. House Subcommittee on Energy and Mineral Resources Oversight). McCauley, RD et al. (2017) Widely used marine seismic survey air gun operations negative impact zooplankton. Nature Ecology & Evolution 1. doi:10.1038/s41559-017-0195. The National Marine Fisheries Service (NMFS) provides both summaries of past fur seal harvests by Alaska Natives and “proposes annual estimates of northern fur seal subsistence harvest on the Pribilof Islands for 2017-2019”. “The Eastern Pacific stock of northern fur seals (fur seals) is considered depleted under the Marine Mammal Protection Act.” This means that any form of subsistence hunting is highly regulated. Lower and upper limits are established for communities relying on this resource. “If the harvest reaches the lower level and the Pribilovians have not met their subsistence harvest needs [the community] must obtain the concurrence of NMFS before harvesting up to the upper level." “Based on the most recent fur seal stock assessment report (2016), NMFS estimates that the current abundance of the eastern Pacific fur seals stock is 648,534. The potential biological removal (PBR) level is 11,802 animals (Muto et al. 2016)"; this is the "maximum number of animals, not including natural mortalities, that may be removed from the stock while allowing the stock to reach or maintain its optimum sustainable population level." The total annual fur seal subsistence harvests for St. Paul and St. George Island "have never exceeded the upper limit of the proposed subsistence need, and have only exceeded the lower limit three times; in 1991 on both islands and in 1993 on St. George." Reported harvest in 2016 for St. Paul was 309 animals and for St. George Island was 83 (Melovidov et al. 2017, Lekanof 2017). “NMFS has contacted the tribal governments of St. Paul and St. George Islands and their respective local Native corporations (Tanadgusix and Tanaq) about setting the next three years' harvest estimates and received and considered their input” as is required by Executive Order 1317 (Native Consultation). For additional information, two Final Environmental Impact Statements (EIS) and one Draft EIS are available from the Alaska Fisheries Science Center. Comments are invited on the proposed harvest levels for the Northern Fur Seals for the 2017-2019 seasons. The 2017-2019 harvest levels are unchanged from 2014-2016 (300 to 500 for St. George and 1,645 to 2,000 for St. Paul). The National Marine Fisheries Service has received a request from the U.S. Navy for authorization to take marine mammals, by harassment, incidental to conducting operations of Surveillance Towed Array Sensor System Low Frequency Active sonar in areas of the world's oceans (with the exception of Arctic and Antarctic waters and certain geographic restrictions), from August 15, 2017, through August 14, 2022. The Navy's activities are considered military readiness activities in accordance with the Marine Mammal Protection Act. In accordance with the Marine Mammal Protection Act, the National Marine Fisheries Service is requesting comments on its proposal to issue regulations to govern the incidental take of marine mammals by Level B harassment during the Navy's activities. The Marine Mammal Protection Act of 1972 allows, upon request, the incidental take of marine mammals by U.S. citizens if certain findings are made and regulations are issued, or if the taking is limited to harassment. Under the Marine Mammal Protection Act, harassment is defined as "any act of pursuit, torment or annoyance which has the potential to either: a. injure a marine mammal in the wild, or b. disturb a marine mammal by causing disruption of behavioral patterns..." This proposed regulation involves both Level A and Level B harassment; Level A harassment has the potential to injure a marine mammal or marine mammal stock in the wild, whereas Level B harassment has the potential to disturb a marine mammal or marine mammal stock in the wild by causing disruption of behavioral patterns, but does not have the potential to injure a marine mammal or marine mammal stock in the wild. This will be the National Marine Fisheries' Service's fourth rule making for the Surveillance Towed Array Sensor System Low Frequency Active sonar operations under the Marine Mammal Protection Act. For this fourth rule making, the Navy is proposing to conduct the same types of sonar activities in the proposed rulemaking as they have conducted over the past fourteen years in the previous three rule makings with the exceptions of updating the LFA sonar duty cycle from 20 percent to 7.5-10 percent based on historical data. In addition, the Navy is proposing a Preferred Alternative (Alternative 2) in their DSEIS that would transmit a maximum number of 255 hours of LFA sonar per vessel per year, as opposed to the previously authorized 432 hours of LFA sonar per vessel per year. The Navy states that these training, testing, and routine military activities may expose some of the marine mammals present in the operational areas to sound from low-frequency active sonar sources. Because marine mammals may be harassed due to noise disturbance incidental to the use of Surveillance Towed Array Sensor System Low Frequency Active (SURTASS) Low Frequency Active sonar during training, testing, and routine military operations, the Navy utilized the most recent National Marine Fisheries Service acoustic Technical Guidance (NMFS 2016) to analyze potential takes of marine mammals. The Navy requests authorization to take individuals of 104 species of marine mammals by Level B Harassment. Further, the Navy states that the probability of taking marine mammals by Level A Harassment is less than 0.001 percent. However, because the probability is not zero, the Navy has included a small number of Level A harassment in its authorization request as a precautionary measure. The Navy will also be including a suite of proposed mitigation measures for marine mammal take that could potentially be affected during SURTASS Low Frequency Active sonar operations. National Marine Fisheries Service (NMFS) received a petition for rulemaking to establish a whale protection zone to reduce noise and disturbance in the San Juan Islands, Washington, to support recovery of endangered Southern Resident killer whales. The whale protection zone proposed would extend three-quarters of a mile offshore of San Juan Island. NMFS is requesting comments on the petition and will consider all comments and available information when determining whether to accept the petition and proceed with the suggested rulemaking. The National Marine Fisheries Service (NMFS) proposed and finalized vessel traffic regulations that prohibit parking vessels in the path of whales and included an approach rule with the whales. A protected area was originally included in these regulations, but was eventually excluded because of the degree of public opposition. Since these regulations, NMFS has conducted a public workshop and communicated with interested groups (including the petitioners). NOAA's Northwest Fisheries Science Center has conducted further research on the impact of vessel traffic on Southern Resident killer whales. The current petition in question was filed in November 2016 by the Orca Relief Citizen's Alliance, Center for Biological Diversity, and Project Seawolf. The area proposed by petitioners is similar to, but wider and longer than the protected area previously proposed by NMFS. Petitioners also propose that NMFS include a one quarter-mile wide buffer adjacent to the whale protection zone. The petitioners base their arguments on the Endangered Species Act (ESA). ESA prohibits any “take” on endangered populations. The petitioners argue that “take”, which can be defined as harassment, harm, pursuit, or any attempt to engage, occurs when commercial and private motorized vessels follow the Southern Resident Killer Whales. If this proposed rule were accepted, NMFS would utilize authorities under the Endangered Species Act (ESA) and Marine Mammal Protection Act (MMPA). If there is the need for regulations to establish a whale protection zone (and if it is advisable). Any scientific and commercial information regarding the effects of vessels on killer whales and their habitat. If the proposed geographic scope of the regulated whale protection zone is appropriate. If there are alternative management options for regulating vessel interactions with killer whales. Any information regarding potential economic effects of regulating vessel interactions. Any additional relevant information that should be considered prior to the agencies accepting the petition.